Food on a stick is more fun to eat! Party food- it needs to feed a crowd and of course grab everyone’s attention so it doesn’t go to waste. 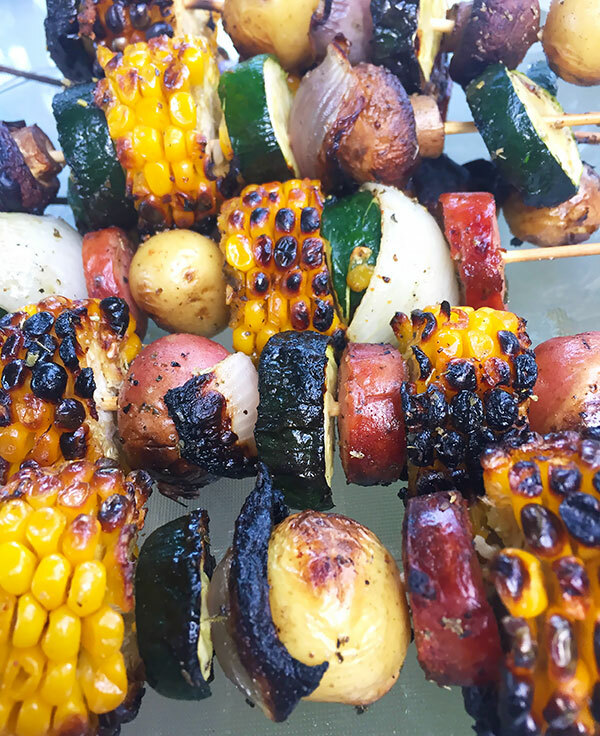 Summer grilling is usually all meat focused, so sides are simple veggies that can be brought to the table when the main course is ready. How about a little combo of both to pregame with besides a dip? 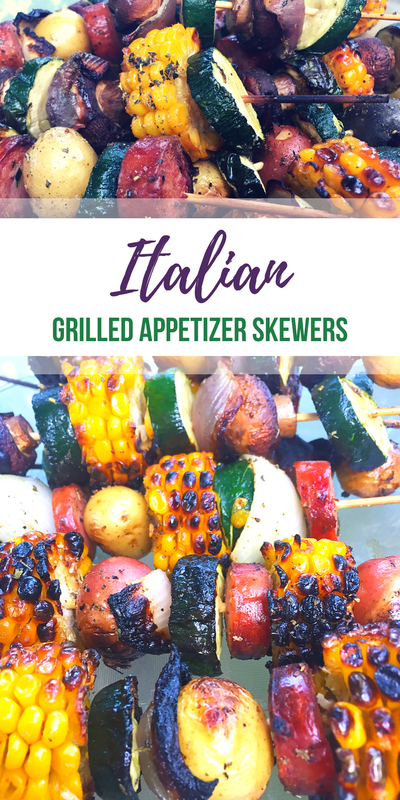 These Italian appetizer skewers offer a variety guaranteed to satisfy all of your guests! You can make them vegan or add some sausage in for those who want a little more than veggies. The endless assortment is up to you! I chose mushrooms, mini tri-colored potatoes, zucchini, corn and onion for my plant power sticks. To offer a bit of meat mixed in with some I also used a link of sausage. I made sure to buy an Italian flavored one, but plain works just fine, as long as it is pre-cooked! Start by slicing! The sausage and zucchini can be cut in to about 1/2″ thick rounds. I left the potatoes and mushrooms whole. Make sure your onion is chopped in to large pieces so they can be skewered in-between the other foods of choice. The corn was not the easiest to cut up (be careful!) so I would say aim for 1″ thick rounds. Then arrange as you please! Once you have all of your skewers ready it’s time to coat with the marinade. I made a very simple one with less than 5 ingredients (unless you want to use fresh herbs). Just combine olive oil, a little sea salt and pepper plus Italian seasoning. Use a basting brush and spread on all sides. Grill them up! Since the potatoes are so small everything should cook up the same amount all together. Just make sure to rotate and re-apply the marinade as needed. Serve warm! 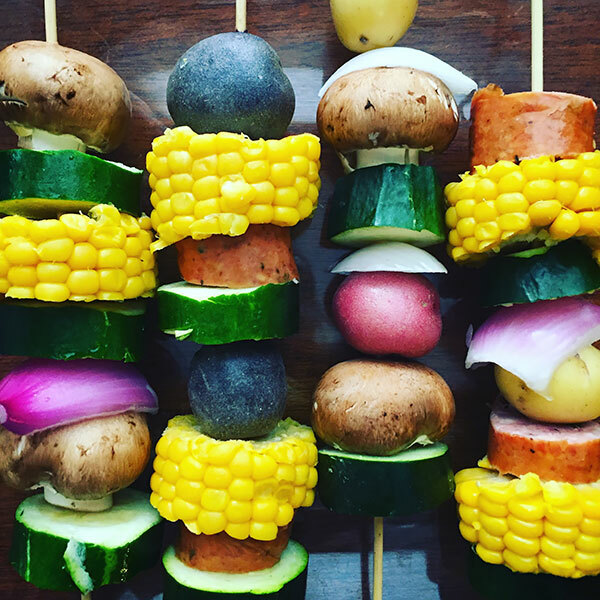 Grilled skewers of zucchini, corn, potatoes, sausage, onions and mushrooms in an Italian marinade. Start by slicing! The sausage and zucchini can be cut in to about 1/2" thick rounds. I left the potatoes and mushrooms whole. Make sure your onion is chopped in to large pieces so they can be skewered in-between the other foods of choice. The corn was not the easiest to cut up (be careful!) so I would say aim for 1" thick rounds. Arrange on skewers and coat with marinade (olive oil, sea salt and pepper, Italian seasoning) on all sides. Grill until done (about 10 minutes) making sure to rotate. Serve warm! 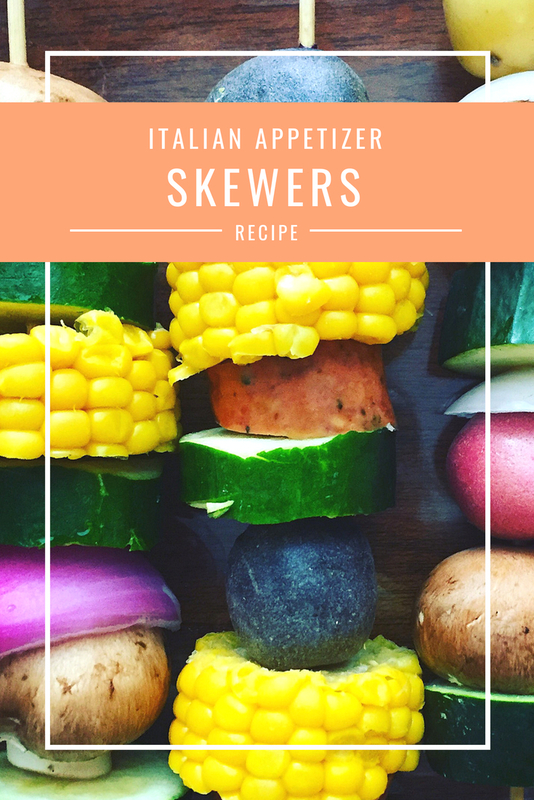 If you liked these Italian Appetizer skewers definitely try my no-bake ones! I put together some Caprese Zucchini Skewers that you serve cold. Either one is a healthy grabbable option!